Hightech Knowledge has been the leader in innovations for badge printing systems for over 30 years. Our latest innovation can scan QR code confirmations (or other barcode types) and print a badge in a matter of seconds! 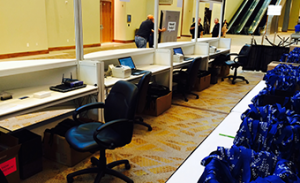 This system is also an ideal solution for handling late and onsite registrations. 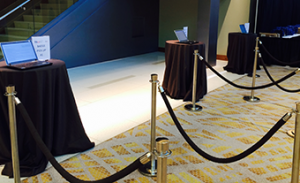 We also offer an attendee check-in system that allows pre-registered attendees to check-in and have their badge printed by the time they arrive at the registration desk to pick up their badge and other collateral material. Our badge printing systems are customized for each client- our clients are not forced into using any ‘standard’ interface. 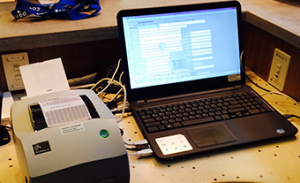 We set up the badge printing to work with your online or in-house registration system. Badge technologies for exhibitor lead retrieval and session attendance tracking include 1-D and 2-D barcodes as well as radio frequency identification (RFID). Typical badge sizes are 4”x3”, 4”x4” and 4”x6”. We can also work with virtually any custom badge size.